Jens Christian Skou (Danish pronunciation: [ˈjɛns kʁæsdjæn ˈsɡʌʊ̯ˀ]; born October 8, 1918) is a Danish medical doctor and Nobel laureate. Skou was born in Lemvig, Denmark to a wealthy family. His father Magnus Martinus Skou was a timber and coal merchant. His mother Ane-Margrethe Skou took over the company after the death of his father. At the age of 15 Skou entered a boarding school in Haslev, Zealand. He graduated in medicine from the University of Copenhagen in 1944 and received his doctorate in 1954. 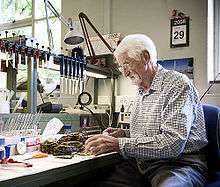 He began working at the Aarhus University in 1947 and was appointed professor of biophysics in 1977. He retired from the Aarhus University in 1988, but he has kept his offices at the Department of Physiology (today part of Department of Biomedicine). In 1997 he received the Nobel Prize in Chemistry (together with Paul D. Boyer and John E. Walker) for his discovery of Na+,K+-ATPase . Skou had taken a few years away from his clinical training in the early 1950s to study the action of local anaesthetics. He had discovered that a substance’s anaesthetic action was related to its ability to dissolve in a layer of the lipid part of the plasma membrane, the anaesthetic molecules affected the opening of sodium channels which he assumed to be protein. This, he argued, would affect the movement of sodium ions and make nerve cells inexcitable, thus causing anaesthesia. Skou thought that other types of membrane protein might also be affected by local anaesthetics dissolving in the lipid part of the membrane. He therefore had the idea of looking at an enzyme which was embedded in the membrane and finding out if its properties were affected by local anaesthetics. He looked at ATPase in crab nerves. The enzyme was there, but unfortunately its activity was very variable and he needed a highly active enzyme for his studies. Eventually he managed to discover that ATPase was most active when exposed to the right combination of sodium, potassium and magnesium ions. Only then did he realise that this enzyme might have something to do with the active movement of sodium and potassium across the plasma membrane. This idea had been postulated many years before, however, the mechanism was quite unknown. Skou published his findings. However, in his paper he was wary of identifying the enzyme with the active ion movement, so he left out the term “sodium-potassium pump” from the title of his paper. Indeed, he seems only gradually to have realised the importance of his discovery, and he continued his studies on local anaesthetics. In 1958 Skou went to a conference in Vienna to describe his work on cholinesterase. There he met Robert Post (born 1920 ), who had been studying the pumping of sodium and potassium in red blood cells. Post had recently discovered that three sodium ions were pumped out of the cell for every two potassium ions pumped in, and in his research he had made use of a substance called ouabain which had recently been shown to inhibit the pump. Post had not read Skou’s paper, but he was excited when Skou told him about his work with ATPase. Post asked whether the enzyme was inhibited by ouabain. At this stage Skou was unaware that ouabain inhibited the pump, but he immediately telephoned to his lab and arranged for the experiment to be done. Ouabain did indeed inhibit the enzyme, thus establishing a link between the enzyme and the sodium-potassium pump. Clausen, Torben (August 2007). "[J.C. Skou identified Na+,K+-pump--a breakthrough and its significance]". Ugeskrift for Læger. 169 (35): 2897. PMID 17878005. Boldyrev, A A (2000). "Na+,K+-ATPase: 40 years of investigations". Membrane & cell biology. 13 (6): 715–9. PMID 10963431. Skou, J C (August 1998). "Nobel Lecture. The identification of the sodium pump". Biosci. Rep. 18 (4): 155–69. doi:10.1023/A:1020196612909. PMID 9877230. Klodos, I (1998). "[Nobel Prize for Jens Christian Skou for the discovery of Na(+)-K+ ATPase]". Postepy Biochem. 44 (1): 6–7. PMID 9738232. Wojtczak, L (1998). "[The Nobel Prize for chemistry in 1997--mitochondrial ATP synthase]". Postepy Biochem. 44 (1): 2–5. PMID 9738231. Clausen, T; Persson A E (May 1998). "Jens Christian Skou awarded the Nobel prize in chemistry for the identification of the Na+, K(+)-pump". Acta Physiol. Scand. 163 (1): 1–2. doi:10.1046/j.1365-201x.1998.00367.x. PMID 9648616. Service, R F (October 1997). "Chemistry prize taps the energy of life". Science. 278 (5338): 579. doi:10.1126/science.278.5338.579. PMID 9381166. Sejersted, O M (December 1997). 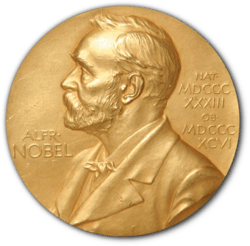 "[Nobel Prize in chemistry]". Tidsskr. Nor. Laegeforen. 117 (30): 4359. PMID 9456574. Skou, J C (1989). "The influence of some cations on an adenosine triphosphatase from peripheral nerves. 1957". Biochim. Biophys. Acta. 1000: 439–46. PMID 2550074. Skou, J C (1989). "The identification of the sodium-pump as the membrane-bound Na+/K+-ATPase: a commentary on 'The Influence of Some Cations on an Adenosine Triphosphatase from Peripheral Nerves'". Biochim. Biophys. Acta. 1000: 435–8. doi:10.1016/s0006-3002(89)80038-1. PMID 2550073. Nobelprize.org - Jens C. Skou's Nobel Lecture on "The Identification of the Sodium-Potassium Pump"